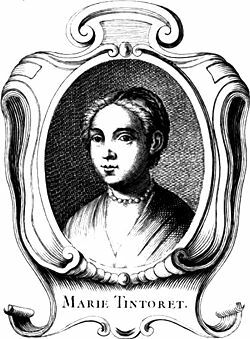 Marietta Robusti (sometimes nicknamed Tintoretta), from a 1745 French publication. Marietta Robusti (1560? - 1590) was a female Venetian painter of the Renaissance period. Trained by her father, Jacopo Tintoretto, she worked in his studio and gained fame for her portrait work. She was known as La Tintoretta after her father. Robusti was invited by both Maximilian II, Holy Roman Emperor (1527–1576) and King King Philip II of Spain (1527-1598) to work at their court, but her father would not allow it. Although she painted many portraits in her day, few have been preserved and others may be wrongly attributed to other artists since only one of her paintings was signed. She was married to Mario Augusta, a Venetian jeweler who agreed to live in the family home, because her father could not be parted from her. She was trained in music, to sing and play the lute. She died in childbirth four years after her marriage, around age 30. Robusti is one of very few known women artists of this period, a group that included Sofonisba Anguissola, Lucia Anguissola, Lavinia Fontana, and Diana Scultori Ghisi. The earliest source for the details of Marietta Robusti’s life is Carlo Ridolfi’s Life of Tintoretto, first published in 1642, although she is mentioned briefly in Raffaelo Borghini’s Il Riposo della Pitura e della Scultura of 1584. These two sources disagree on the year of her birth: according to Borghini, she was born in 1555, but Carlo Ridolfi indicates that she was born in 1560. Marietta was born and lived her life in Venice, the eldest daughter of seven children of the painter Jacopo Robusti, better known as Tintoretto, from whom she inherited her nickname, la Tintoretta (translated as "little dyer girl," after grandfather’s occupation as a tintore, or dyer). She is thus variously known as Marietta Robusti, Marietta Tintoretto, and la Tintoretta. Since conventions of the time dictated that women remained in the privacy of the domestic sphere and were not welcome in the public world of art production and sale, Marietta and her female contemporaries gained access to the art world through their artist fathers or brothers. Her artistic training consisted of serving an apprenticeship in the collaborative environment of her father’s workshop, where she probably contributed to her father’s paintings with backgrounds and figure blocking, as was the usual distribution of labor in painting workshops of the time. Ridolfi describes Marietta’s close relationship with her father in some detail. She learned to paint at his knee, and as a child she dressed like a boy so that she could go everywhere with Jacopo and work in his studio. She inherited her father's artistic style, and by the time she was a teenager, their respective works were almost indistinguishable. Marietta was also trained to sing and play the harpsichord, clavichord, and lute, having been privately tutored by the Neapolitan Giulio Zacchino. She often played and sang for her father while he worked or in the evenings in their home. Marietta's portraiture received acceptance and fame by the 1580s. In the aristocratic circles of Venice it had even became fashionable to sit for "La Tintoretta." Her likeness of antiquarian Jacopo Strada so impressed Emperor Maximilian that he sent her an invitation to be the painter of his court. King Philip II of Spain and others also expressed interest in hosting her as a court painter. However Marietta refused all offers to leave her house because her father could not bear to part with her. In 1578 he arranged for her to marry a Venetian jeweler, Mario Augusta, to ensure she would always stay near him. Despite her skill and popularity as a portrait artist, Marietta received no known commissions for major religious works such as altarpieces or other church decorations, she was mainly a portraitist. She died of unrecorded causes in 1590, most likely in childbirth, just four years after her marriage. She was buried in the church of Santa Maria dell’Orto in Venice. There is still disagreement about the proper attribution of Marietta Robusti's surviving works. Until recently, the "Portrait of an Old Man with Boy" (a portrait of her uncle, c. 1585; Kunsthistorisches Museum, Vienna) had been attributed to her father, but is now considered to be her own work. The new attribution was made in 1920, when her signature "M" was found on the work. Another work, "Portrait of a Woman with a little Dog," is more controversial. This painting had long been thought of as a work by El Greco, but is now thought to belong to La Tintoretta. Considering her popularity during her life time, it seems likely that many of her paintings have been attributed to either her father or another male painter of the day. Current feminist scholarship is involved in an attempt to rectify these errors. One painting that is conclusively attributed to Marietta Robusti is her Self Portrait (c. 1580; Uffizi Gallery, Florence). This portrait depicts Marietta posed before a harpsichord, holding a musical text that has been identified as a madrigal by Philippe Verdelot, "Madonna per voi ardo." It has been postulated that the inclusion of this text, whose opening lines are "My Lady, I burn with love for you and you do not believe it," suggests that the painting was created for a male viewer, possibly Marietta's husband. Another portrait with the same face is attributed to an earlier unknown artist. Obviously similar, this painting may be yet another "self-portrait" but has not been conclusively determined to be another painting by Marietta. Another current attribution to Marietta is Portrait of Ottavio Strada (c. 1567-1568; Stedelijk Museum, Amsterdam); and two small paintings of the Virgin and Child (dates unknown, Cleveland Museum of Art, Ohio). Portrait of Two Men (Gemäldegalerie Alte Meister, Dresden), signed "MR," is thought to be Marietta Robusti's only surviving signed work. 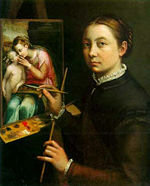 Sofonisba Anguissola, Self-Portrait, 1556, contemporary of "La Tintoretta"
Marietta Robusti painted in her father's studio for 15 years while simultaneously completing her portrait commissions. She won great popularity during her lifetime as a portraitist and had many commissions, although few survive or have been attributed to her father or another artist. She could have become quite famous and her work well known by becoming a court painter for either Emperor Maximillian or King Philip II of Spain, but her father would not let her leave his side. Women during this time were subject to the desires of their fathers or husbands. Her career was thus always under the control of her father, and did not have the opportunity to develop broadly. As she worked alongside her father, his work and hers became indistinguishable and they worked on many paintings together. Jacopo relied deeply on his daughter for his personal happiness and his work. Only after a suitor agreed to live with her under the Tintoretto roof did Jacopo allow Marietta to marry. Her life and its lack of freedom was typical of sixteenth century women. Misattribution has long been a problem with women artists from the past. Modern art historians have uncovered a number of Renaissance women artists who had not been well known in the past but now are being recognized, a few are Sofonisba Anguissola and her sister Lucia Anguissola, Lavinia Fontana, and Diana Scultori Ghisi. These women lived at the time of Michaelangelo and other masters, but only Sofonisba was ever recognized by Michaelangelo and informally tutored by him. Even though only a few paintings survive that can be clearly attributed to her, the fact that she was popular in her age as a portraitist opened the doors of society for other women artists to be accepted. She was a contemporary of Sofonisba Anguissola (1532 - 1625), who did become a court painter for 18 years to King Philip II of Spain. It is likely that if "La Tintoretta" had lived as long, she would have gain similar honor and recognition. All links retrieved February 9, 2009. ↑ Eric Newton. 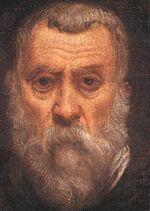 Tintoretto. (London: Longmans, Green and Co., 1952), 62. ↑ Carlo Ridolfi. Life of Tintoretto, trans. Catherine and Robert Enggass. (University Park, PA: Pennsylvania State University Press, 1984), 99. ↑ H.T. Niceley, "A Door Ajar: The Professional Position of Women Artists," Art Education 45 (2) (Mar., 1992): 6-13. ↑ “Marietta Robusti.” Grove Art Online, s.v. George Mason University Lib. accessed February 10, 2008. ↑ Katherine A. McIver, "Lavinia Fontana's 'Self-Portrait Making Music'," Women's Art Journal 19 (1) (Spring-Summer 1998): 3-8. McIver, Katherine A., "Lavinia Fontana's 'Self-Portrait Making Music'," Women's Art Journal 19 (1) (Spring-Summer 1998): 3-8. Niceley, H.T. "A Door Ajar: The Professional Position of Women Artists," Art Education 45 (2) (Mar., 1992): 6-13. This page was last modified on 15 August 2018, at 15:40.